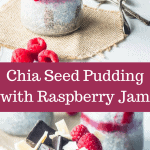 Come check out this amazing Chia Seed Pudding with Raspberry Jam. I have the biggest sweet tooth there ever was! I am the Sweet Tooth queen! For real, I could have sweets for breakfast, lunch and dinner. You can see, by browsing my blog, that I state true facts here! What happens is that, if I were to eat all the sweets I bake, or if I allowed myself to make more sweets than I already do, I would probably be a planet! That’s where the chia seed pudding comes in! It’s so freaking easy to make, I swear I can make it with my eyes closed. And the best part is that it’s so versatile, you can literally top it with anything! There are two ways to approach Chia Seed Pudding making: either by whisking the ingredients, or by blending them. By whisking the ingredients, you save yourself some dishes (hello, who likes to wash blenders? ), and you end up with the most delicious texture, biting into the chewy seeds! When you use a blender, you end up with a smoother texture, just as delicious. But seriously, I enjoy the chewy seeds way too much, so I always end up whisking my ingredients! For sweeteners, I like to use maple syrup, or even dates! Get creative, add some fruit, nuts, use different kinds of milk. Make it at night, leave it in the fridge for breakfast on the next day. You will be enjoying a healthy, sweet and delicious treat for breakfast, and that will be the best part of your morning (ok, besides coffee). 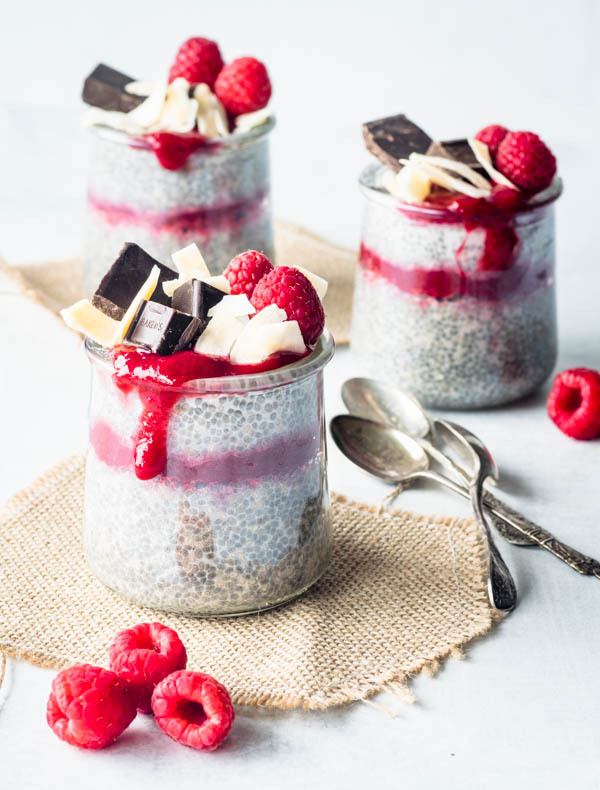 This Chia Seed Pudding with Raspberry Jam is a delicious treat. Topped with toasted coconut, dark chocolate and fresh raspberries! Make it at night and enjoy for breakfast the next morning! Mix raspberries and maple syrup in a small saucepan. Bring to a gentle boil over medium low heat, stirring. Let mixture simmer gently for a couple minutes. Mix cornstarch and water together in a small bowl. Add cornstarch mixture to pan, keep stirring and simmering over medium low heat for a few minutes, until jam is thick and has a deeper color. Pour over a fine strainer and use a spoon to stir the raspberries and separate the jam from the seeds. Place in a covered bowl in the fridge until cold. Whisk together all ingredients. Pour into cups alternating with a layer of jam. Let it chill for 4 hours or overnight. Top with more jam, dark chocolate pieces, toasted coconut and fresh raspberries. Tive a sorte de provar, delicioso!!!!!!! I have to be honest, I have tried it a million different ways and I just don’t like chia seed pudding. I have given up trying to force myself to like it but it is so darn pretty! haha to each its own, right, Pat! You’re absolutely right! It’s really pretty (and delicious to me at least ahaha) 🙂 have a great day, friend!! That is soooo pretty! I love chia pudding! My favorite way to prepare chia pudding would be with coconut milk or almond milk. Very filling and satisfying! These are gorgeous! And whisking is so smart! I hate cleaning the blender-especially when I use chia seeds! 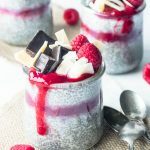 I have always blended my chia puddings, but I think I might have to try to whisk it now! And the toppings looks soo good too! I have a bag of chia seeds in my cupboard that I was sent ages ago for a health challenge, and I’ve never known what to do with them – until now! Just pinned your recipe so I can try it out sometime for myself. Thank you so much, Kacie! Hope you enjoy the chia seed pudding!! 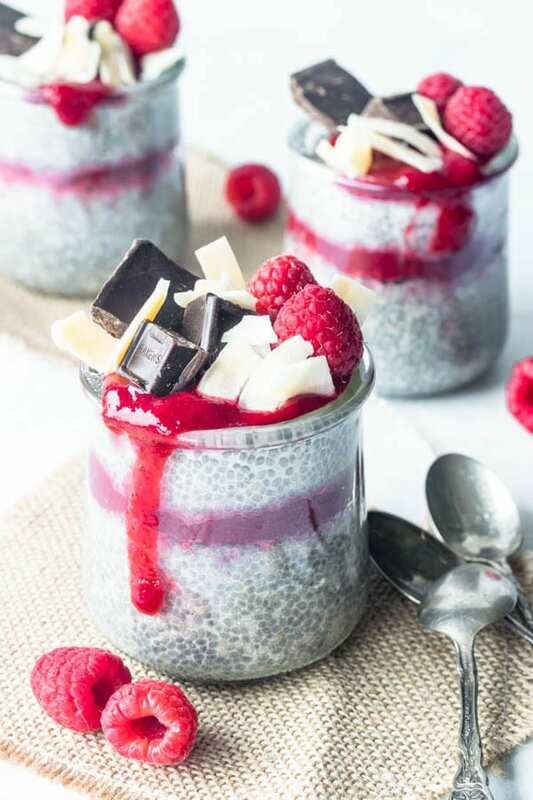 I am not a fan of sweets but looking at your Chia Seed Pudding with Raspberry Jam, I want it. I am excited to try it. This is actually perfect for those who aren’t fans of sweets!! It’s not sweet at all!! Totally healthy and delicious!! I love sweets too but I don’ t buy it too much because I wouldn’t be able to stop eating it. I Love how you added the chocolate on top. So pretty. I love making chia see pudding. It’s so healthy plus my two toddlers can’t get enough of it. I usually use blueberries or strawberry jam. I have to try it with raspberry. My toddler loves them too!! They’re a huge hit, no matter what kind of toppings I add to them!! This is my perfect breakfast! I love chia pudding with fruity jams. 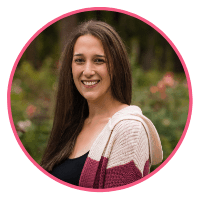 Great tip about the blending! I never thought to do that before. hahaha, I love this post. I am a big fan of chia pudding but I hate cleaning the blender afterward. I haven’t tried whisking it – I should give it a try. Love your post. I can relate so well lol. Now that’s what I mean when I say healthy dessert. Yes!! It was a healthy dessert! And very delicious too! Thank you Haley!